Some people may think that one who writes about wine must have a glamorous life, if the others do, then I must be doing something wrong. There are occasions when the dinner is fabulous and the wines are stellar, but then there are nights (and a lot nights) where one sits home and relaxes after work. I am sure that my body and my physician are both happy that we do not go out and “wine and dine,” but then so is my wallet. I try to write about all the wines that I have had over the years, and I have been fortunate to have had some great wines, but normally the wines that we enjoy on a daily basis, are good basic wines. I can’t imagine a life of nothing but Latour and La Tache, though it would be a great dream sequence. I have to admit that my Bride is a wonderful cook and she makes everything look easy, as compared to me when I am in the kitchen, because all of the dishes and pots and pans seemed to be utilized even for a simple dish. On the days when we have a roast chicken or a roast turkey, I look forward to her way of making the leftovers come to life again in a pot pie. Some times she gets fancy and will make serve salmon or even crab cakes with a Remoulade Sauce. Listen I am not a little overweight because I eat bon-bons. We usually do not finish a bottle of wine, if we are dining at home, though it is funny that we do when we are out. It is not unusual to see a couple of bottles opened in the house at the same time, the whites may be in the refrigerator while the reds will be on a side board. We had a couple of wines open the past couple of days. 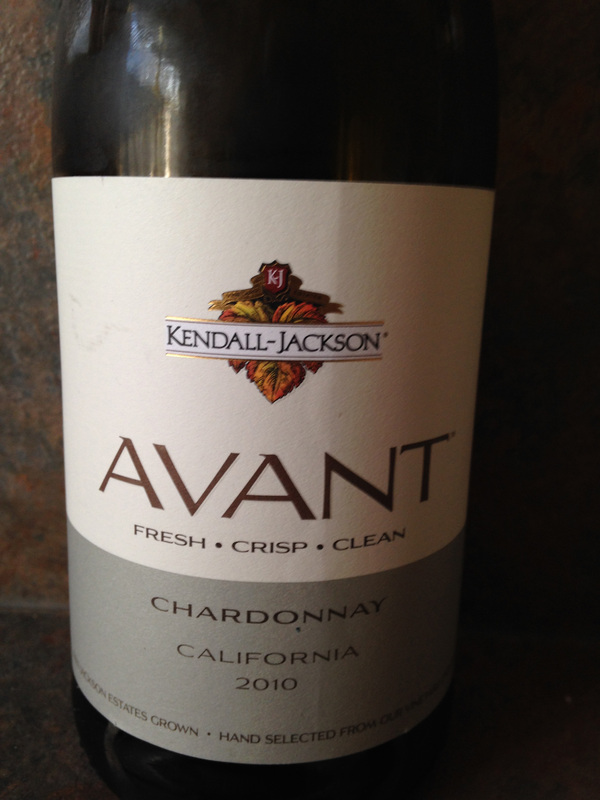 We were enjoying a bottle of Kendall-Jackson Avant Chardonnay 2010 and it has a different taste and finish compared to the classic Kendall-Jackson Vintners Reserve that is everywhere. We have his wine every now and then and it is a crisp Chardonnay and not fussy. This wine is not “buttery” and that is fine and appreciated at times, since it is made in Stainless Steel and neutral oak barrels. There are times when a simple well made wine is just perfect. The other wine that we had opened was a surprise, and a well enjoyed surprise. It was a gift from one of the many ladies at my Bride’s annual Christmas party that I have written about. 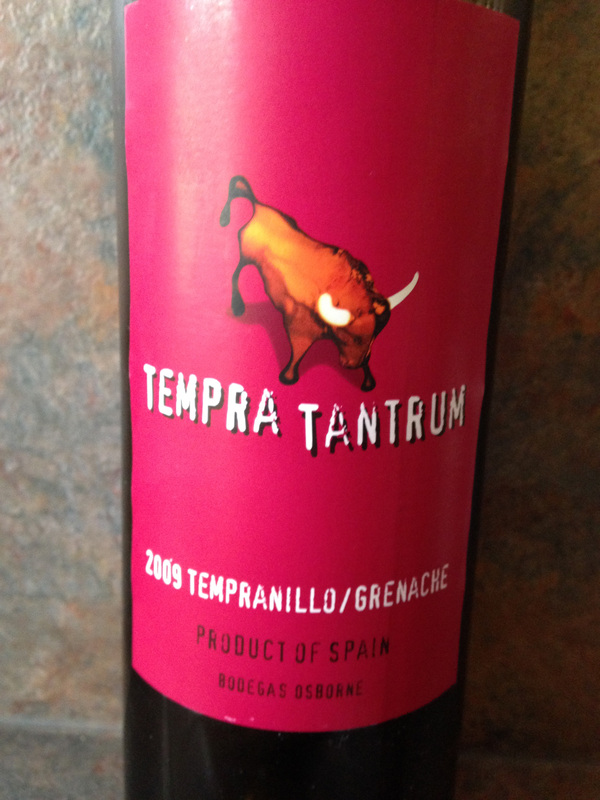 Tempra Tantrum 2009 is a blend of 60% Tempranillo and 40% Grenache, though from research I have found out that they make a couple of other blends with Tempranillo. The wine has the designation of Vino de la Tierra de Castilla, which is in La Mancha (as in Man of La Mancha) and is home of about two thirds of all the vineyards in Spain. I happen to like both of the varietals, so when I was opening the bottle which brought back days of my youth, as it was a twist off, but that had a totally different connotation back then. The firm of Bodegas Osborne should be very pleased with this product, as I know I was, and listening to my Bride go on about how tasty the wine was, was a plus. For a bargain priced wine there was a lot of body and tannins, and the two varietals were pleasant in the blending with just enough of the spiciness of the Grenache to compliment the smoothness of the Tempranillo. I think we shall have to get some more of this wine for the nights that we cocoon at home until the cold weather takes a break. This entry was posted in Wine and tagged Avant, Bodegas Osborne, California, Chardonnay, Grenache, Kendall-Jackson, La Mancha, Spain, Tempr Tantrum, Tempranillo, Vino de la Tierra de Castilla. Bookmark the permalink.